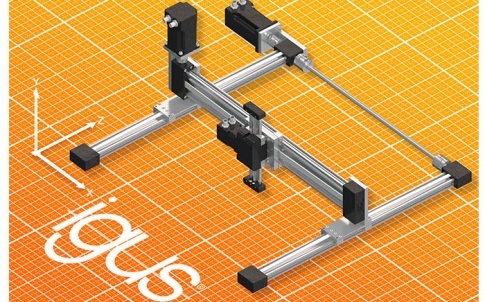 Cost-effective automation of simple tasks is the aim of the igus robolink product range. In the new, compact version, the control system is located in the base and the arm is operated without the need for a switch cabinet and PC. 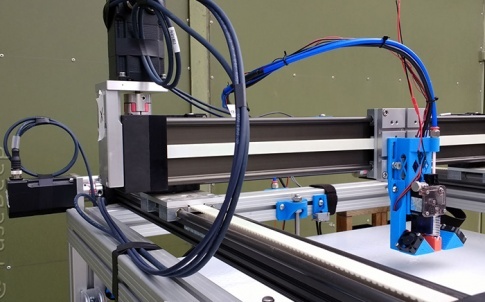 The new robolink solution is a complete 4 or 5-axis robot in which a control unit from Commonplace Robotics GmbH (CPR) is integrated at the base of the robot arm. The robolink is moved via four or five motor controllers. This saves space and makes the robot arm even more flexible during transport or for a quick adaptation of the automation process. The modular CPR control system complements robolink with service-friendly electronics and intuitive control software that can be used to display and program the robot’s movement sequences. For example, programs can be created using Joint, Linear, DigitalOut, Loop, or If-Then-Else commands. Further components, such as image processing systems, can be integrated via plugins. The software is supplied on CD, so that only a Windows-capable computer is required for commissioning. The standalone solution dispenses with the otherwise obligatory PC connection after installation and can be operated with a touch display. The control system can also communicate with other controllers via inputs and outputs. 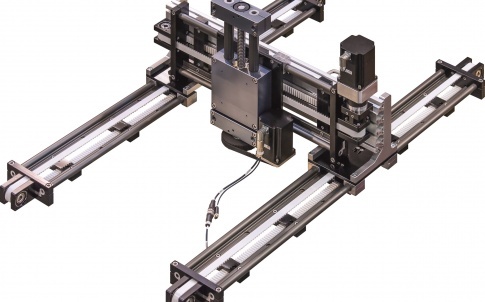 Simple processes can be automated cost-effectively with the robolink modular system. These include pick & place applications in order picking, feeding, quality assurance, assembly tasks or image processing applications. In addition to a preassembled articulated arm made of joints with a wide range of gears, motors and connector modules, users can also put together individual systems. In addition, compatible grippers and lifting vacuums are available, for example from Schunk or MM Engineering. Configuration of the modular robot arm is simple via the robolink Designer online tool: www.igus.co.uk/robolink-designer The tool also provides a visual simulation of the arm’s movements and, upon completion, the order can be placed for dispatch. 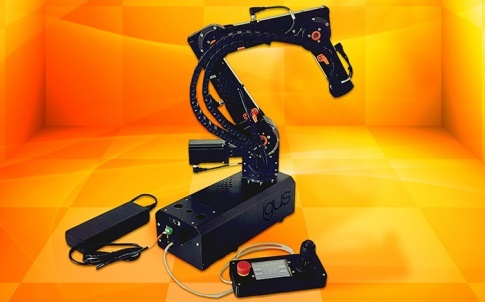 For more information about the robolink articulated robot arm, please visit: www.igus.co.uk/robolink or call igus directly on 01604 677240. Igus is the largest producer of reinforced plastic energy chains and injection-moulded polymer bearings. The range of polymer bearings includes Iglidur plain, Igubal spherical and Drylin linear bearings. They offer an excellent price-to-life relationship and are developed under the toughest conditions. They are oil, maintenance and lubrication free, low wear, resistant to dirt and dust, corrosion free and simple to fit. 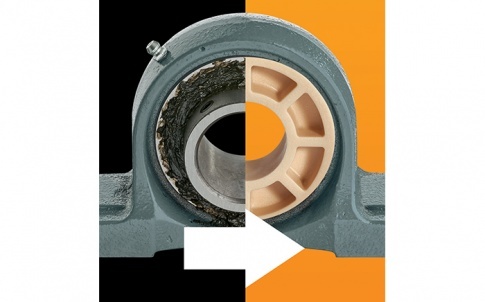 Igus also has the data to precisely predict the lifetime of these bearings within a specific application. Energy chains are the umbilical cord of modern machines. They minimise downtime and protect, support and extend the service life of cables and hoses. The broad range incorporates more than 30,000 innovative, low-cost products. From the smallest ‘micro’ chain to the largest chain in the world, the E4.350, Igus energy chains are capable of long and short travel distances at high speeds in all axes. 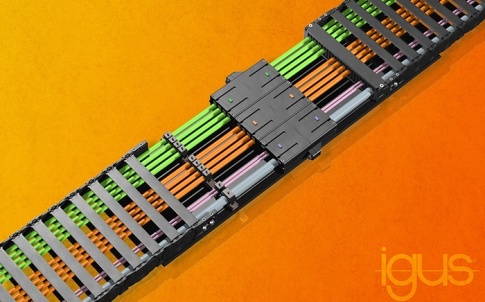 Igus also has its own cable series, Chainflex, specially designed with energy chains in mind. They are highly flexible cables, offering a long service life and very small bending radii. A wide range is available, from small signal cables to large power cables, high-speed data cables and glass fibre-optic cables. The company’s energy chains and Chainlflex cables can be delivered as a fully harnessed and pre-assembled Readychain system, cutting purchasing, warehousing and installation costs.